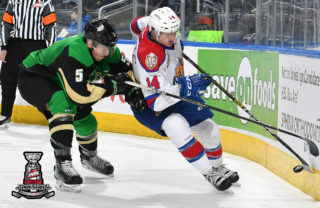 Victoria, BC – The Prince Albert Raiders (40-5-0-2) became the first team in the CHL to reach 40 wins this season with a 4-1 victory over the Victoria Royals (23-20-1-0) on Tuesday night at the Save-On-Foods Memorial Centre. This is the first Raider squad to reach 40 wins on the season since the 1998-99 edition that finished the season with 45 victories. Cole Fonstad was the only Raider with multiple points on the night, registering a goal and an assist to collect his third and fourth points on the current road trip. 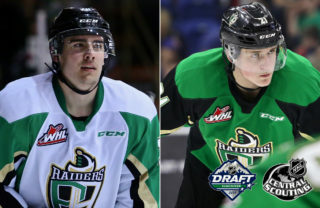 Early on the Raiders had a couple of great chances to get the game’s first goal. First, Fonstad got behind the defence but was denied on a breakaway by Griffen Outhouse. Shortly after, a pretty passing play saw Justin Nachbaur get the puck in front of the Royals goaltender but was unable to solve Outhouse. The Raiders opened the scoring on a late-period power play. Fonstad worked the puck down low to Ozzy Wiesblatt who spotted Nachbaur in the slot. The Cross Lake, MB product snapped a shot past Griffen Outhouse for his 12th goal of the year with 4:58 to go in the first. SCORES! @Jnacks55 opens the scoring with a power-play goal! Just 47 seconds later, the Raiders made it 2-0. 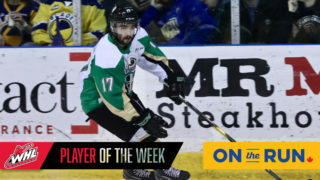 Sean Montgomery was sprung down the right wing by former Royal Dante Hannoun and beat Outhouse with a quick wrist shot for his 20th of the season. 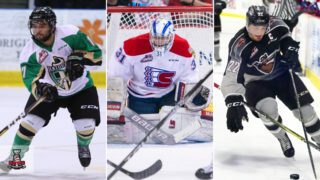 It’s the first time in his WHL career that Montgomery reached the 20-goal plateau. SCORES! Snipin’ Sean Montgomery beats Outhouse! Dante Hannoun picks up the assist on the goal. Nachbaur almost made it 3-0 shortly after. From the left faceoff circle, Nachbaur fired a shot that beat Outhouse but ricocheted off the crossbar. The Royals cut the lead in half exactly 1:00 into the second. Kaid Oliver found D-Jay Jerome in the slot and the former Raider beat a screened Ian Scott for his 18th of the season. Less than four minutes later, Fonstad restored the Raiders’ two-goal lead. The Montreal Canadiens prospect stripped Jameson Murray of the puck, cut towards the goal, and slid the pick through Outhouse for his 18th of the year at the 4:27 mark. SCORES! What a play by @ColeFonstad! He slides it through Outhouse to restore the two-goal lead. Parker Kelly had a chance to extend the lead early in the third period. Just 20 seconds in, his stick was slashed out of his hand on a breakaway. The Ottawa Senators prospect was awarded a penalty shot, but was turned aside by Outhouse. The Raiders put the game away midway through the third period with a power-play goal. Max Martin collected the puck in his own end, skated through the Royals defence, entered the zone and lifted a backhand over Outhouse’s shoulder and in for this sixth goal this year to round out the scoring. SCORES! What a rush by @mmartin10! He goes coast-to-coast and roofs it over Outhouse! Scott was strong in net for the Raiders again, stopping 20 shots for his 28th win of the year. Outhouse turned aside 27 attempts in the loss. 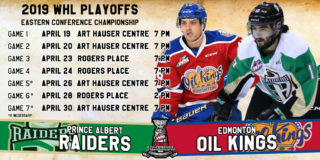 The Raiders wrap up their season series against the BC Division on Thursday night when they head to the Langley Events Centre to take on the division-leading Vancouver Giants (29-12-2-0). 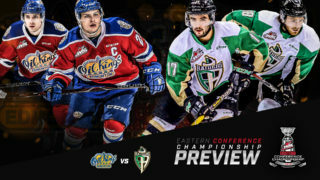 Puck drop is 9:30 p.m. Catch the game at The Rock And Iron Sports Bar at the Prince Albert Golf and Curling Club, listen on 900 CKBI, or watch on Sportsnet and Sportsnet 360.